When I used to travel to Singapore, I always made sure to stop at VeganBurg – a country-wide vegan burger joint that prided itself on healthy vegan options. 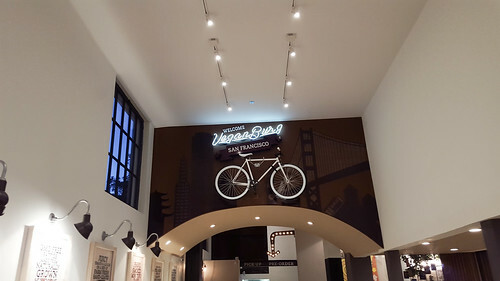 So when I heard their first (and only) US location was in the heart of San Francisco’s Haight-Ashbury, I knew I needed to go. While the menu options seemed little lighter than I remember, the space itself was really nice, clean, and bright. I ordered the “Cracked Mayo” burger with seaweed fries (not as hippy as they sound, I promise), and Kristin ordered the Smoked Franks with a side of fries. Landen went with the standard – Chicken Tenders. 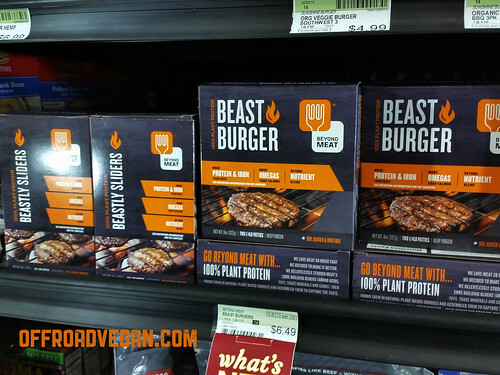 I have been waiting for the Beast Burger from Beyond Meat for a VERY LONG time. Ever since my friend over there told me it was in “the works” I wanted to try it out. As a vegan, veggie burgers are crucial. First, they give me a staple I can relate to from my meat days. I know to some this may sound stupid, but that’s just how this vegan rolls. On a nice summer day, I still like tossing something on the grill other than corn and asparagus. 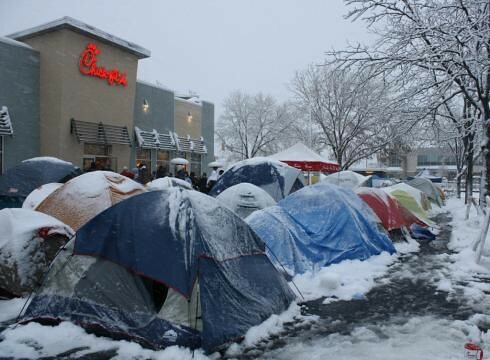 Or, in the winter I may crave a bacon double cheeseburger. Beast Burger with crispy onions, pickles, and BBQ. There are a lot of contenders in this space too. 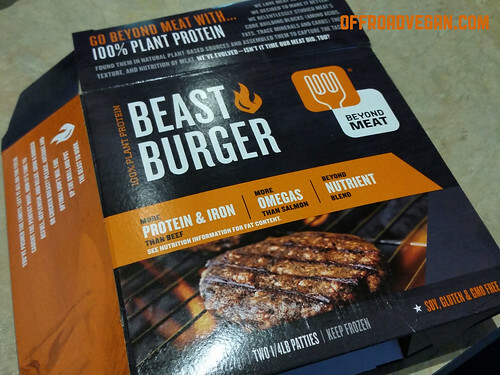 Companies like Gardein, Field Roast, and now Beyond Meat all produce decent burgers (in addition to the Boca and other large brands). But it seems like each one trades off something. Gardein’s burgers are good, but plain and oily. Field Roast’s Hand formed burgers require you to refinance your home mortgage ($7.99 for 4 small patties) and companies like Morningstar add egg whites so they are not even vegan. All of this meant I was really stoked to finally get my paws on a brand new burger. As always, the retail packaging was designed well and the price was good. 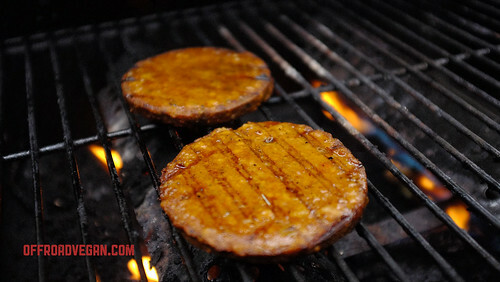 Two 1/4 pound patties (frozen) per $6.49 box means a premium, all vegan, non-GMO burger patty for $3 and change. I tossed them on the grill along with some asparagus. 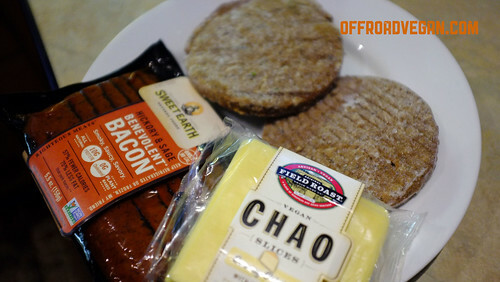 I decided to pair them with some vegan bacon strips from Sweet Earth and Chao regular cheese slices. 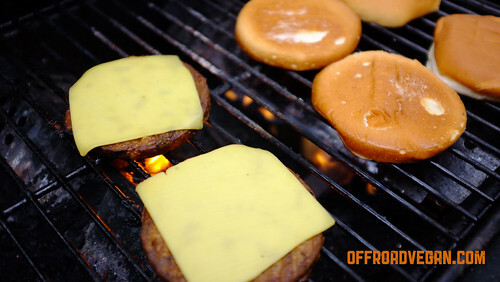 These burgers grill up really nicely over a well seasoned propane grill. I applied a little spray olive oil to each side (per the instructions) to help them out a little. I heated them up really well, melted some Chao cheese on ’em, dropped the bacon on and had a GREAT lunch. My first impression was yes. 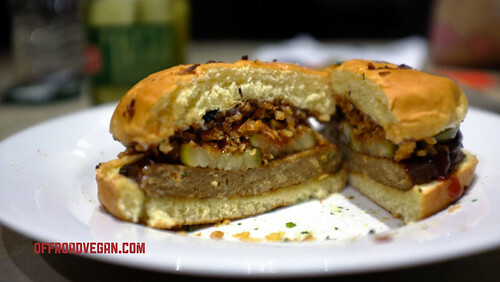 Yes to a good-tasting, hearty as heck, well made vegan burger. The flavor was right in the middle of the “not so meaty but still meaty enough” scale that companies like Beyond Meat must navigate carefully. Features a “beyond nutrient blend” which apparently makes me healthier. The claims are right on the box. The ingredient list, while long, is all natural, basic ingredients. I see things like pea protein, canola oil, beet juice powder, onion powder, paprika, etc. 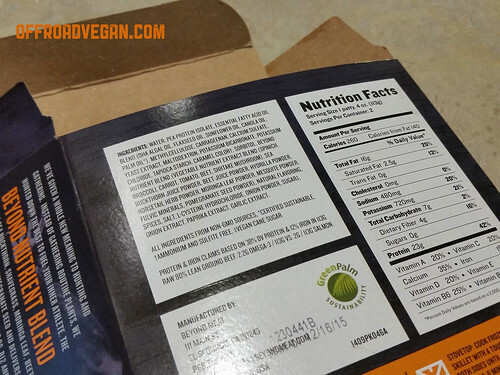 A long ingredient list and pretty decent nutritional specs. I mean when you look at the actual nutrient benefits of these burgers, combined with the taste and texture, relatively low cost, no worry of food-borne pathogens, ease of cooking, and a multitude of other benefits….shouldn’t’ we? Some Chao melti-ness on my beasts. At least one thing is for sure. My freezer will be full of these things, and I look forward to dragging some with me to Moab and the Rubicon later this Summer.